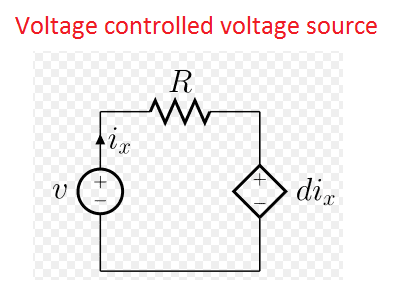 Let see, the definition of Voltage source, current source, ideal voltage sources, ideal current sources, independent voltage sources, and independent current sources. 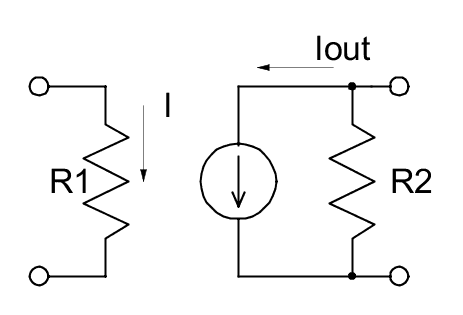 A voltage source whose output voltage remains constant, at any load current or fixed voltage at changes in load is known as an ideal voltage source. 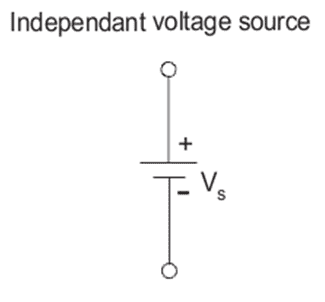 The internal resistance of an ideal voltage source is zero. But in practice, we can not construct ideal voltage source, because of the without internal resistance we cannot build a voltage source. Also in real-world voltage source cannot supply unlimited current. 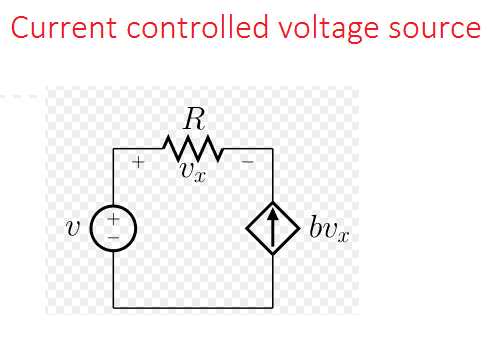 A voltage source is the dual of a current source. Real-world sources of electrical energy, such as batteries, generators, and power systems, can be modeled for analysis purposes as a combination of an ideal voltage source and additional combinations of impedance elements. Independent voltage sources, the source voltage depends on other voltage or current sources in the same circuit or network. The dependent voltage source has four different types. 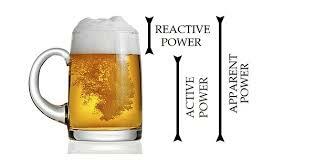 The source delivers current as per the current of the dependent element in the circuit. The source delivers Voltage as per the current of the dependent element in the circuit. Note: The sign or polarity of each dependent element to be considered. Independent voltage is nothing but the source voltage does not depend on either the magnitude or direction of the current flowing through the source. Hence the total output voltage is equal to the algebraic sum of all individual voltage sources. This technic is mainly used in battery storage system, i.e UPS system. To build a 320 V DC Voltage, we have to connect individual single cell with the output voltage of 2 V each and 160 numbers batteries in series. In the same way, to get 110 VDC we need to connect 55 batteries in series. 110 VDC is used in all electrical switchgear controls. Example: Star delta wiring, Circuit breaker internal and external wiring, Turbine control wiring, emergency pumps etc. 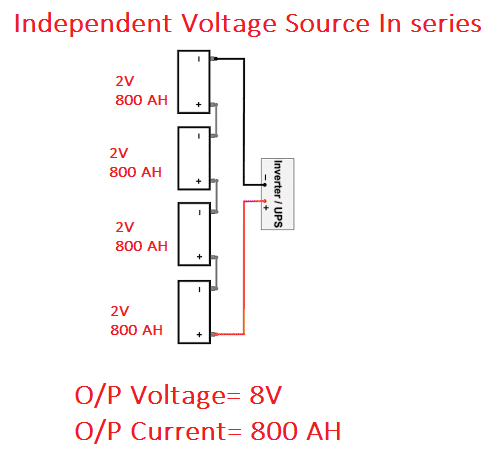 In series connected independent voltage sources, the output voltage will increase and the total current is equal to one of the battery capacity (rated current). 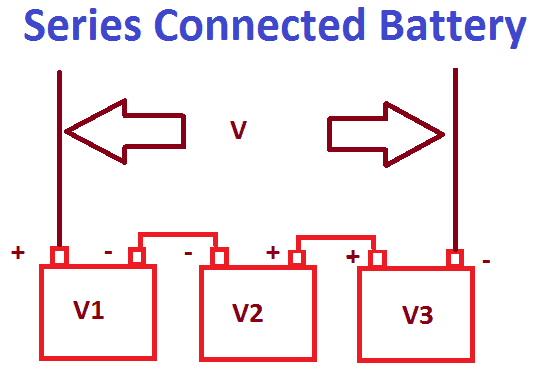 i.e consider above case the 2-volt battery has 800 AH (Ampere hour), if 160 number of battery is connected in series means the total output voltage is 320 VDC, and the output current is 800 AH. 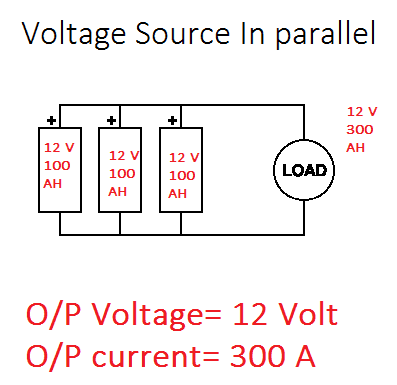 When you connect all the battery in parallel means, the output current will get increase but the output voltage remains same (rated voltage of the single battery). Note: All the battery’s output voltage should be equal and the current is not required to be in rating. Application: This method is used to start heavy engine like diesel generator’s starter.